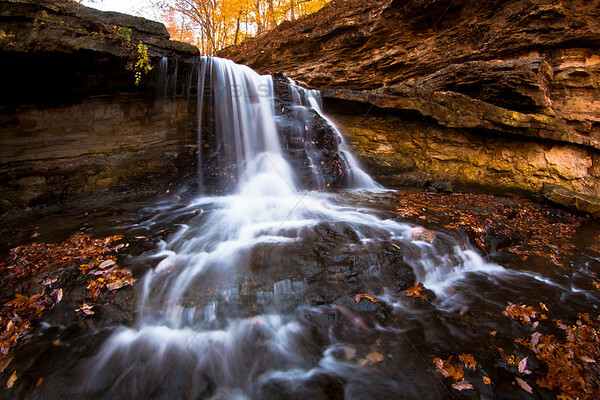 The waterfall at McCormick’s Creek State Park near Spencer, Indiana is a popular tourist attraction bringing in photographers and outdoors lovers from across the state and beyond. This photo was taken in October 2014 on a beautiful fall afternoon in southern Indiana. McCormick’s Creek State Park Waterfall by Joey B. Lax-Salinas is licensed under a Creative Commons Attribution-NonCommercial-NoDerivs 3.0 Unported License. Permissions beyond the scope of this license may be available at http://www.joeyblsphotography.com.